Safely and effectively control the flow of nitrogen to dispense wine or service a gas blender while ensuring you never run out with this Micro Matic double gauge regulator! 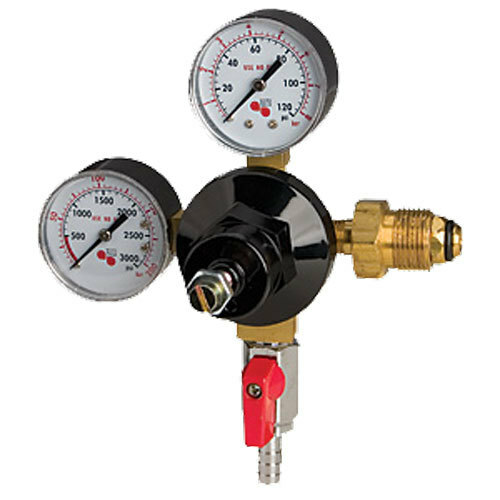 This primary regulator from the affordable Economy series comes with an output gauge that has a 0-120 PSI range so you can quickly monitor the amount of nitrogen flowing from your gas tank, and that high-pressure tolerance is exactly what makes this model perfect for gas blender and nitrogen generator applications. It also features a tank gauge that has a 0-3000 PSI range so you always know how much pressure remains in your cylinder. Regulating nitrogen is key in providing guests with quality beverage because a pressure that's too low or too high will negatively affect the drink's taste and presentation.